Forthea Interactive Marketing > Blog > Digital Marketing > What is Pinterest? How can it help my business? Pinterest has caught on in a big way – especially for all the design fanatics out there – but like a lot of folks, my wife Lauren & I signed up for it and then scratched our heads wondering what we were supposed to do with it. Yet another shiny object to get distracted with – so for a few months, our account just sat there. Then finally last week, I told Lauren she needed to start “pinning” things – so she did – but neither of us really understood why or how to incorporate it into our site. So over the weekend, while the 3 month old was passed out, I did some digging and started to figure out the “Pinterest Phenom”. Let me explain this like I would explain it to my mom, who still thinks I work for Google, God Bless her! Basically – Pinterest is a platform for you to share and organize your bookmarks. Instead of all the sites you love, or things you want to remember to look at going into that black hole of a Bookmarks folder in your browser – you can create Boards (aka folders) and share the bookmarks with others. You can search Pinterest using the search box, categories or tag functions – just like a wordpress blog. You pin items you like – or that match a theme (a.) by copying the URL of that website and then pasting it into the Pin It box, (b.) using the handy Pin It tool on your browser (see below) or (c.) the Pin It button on the site. Why pin? Ever start shopping or researching online only to come out of it with 12 bagillion ideas and options? Ever try to remember that one thingy that you looked up 2 months ago that would be perfect for your latest project? That’s why you pin. I started pinning based on a few of my favorite things – just to get a feel for it – and I’ll be expanding soon. So far I’ve got a great board about Knobs (because there are so many great ones out there and I’m always forgetting where I saw the last one), Things with Small drawers (unhealthy obsession – deal with it) & recycled wood furniture. I have a site – How does this help me? Beyond the obvious organizational purpose for your future ideas – it can help you if you set it up right on your site. But, the larger question comes from wanting to make sure you (a.) get credit for your items on Pinterest and (b.) help users easily Pin your items on Pinterest. That’s an easy fix as well. I’ve done this on a few posts this morning (see the Union Jack – pin it button is at the bottom) and will be doing it for more in the future. 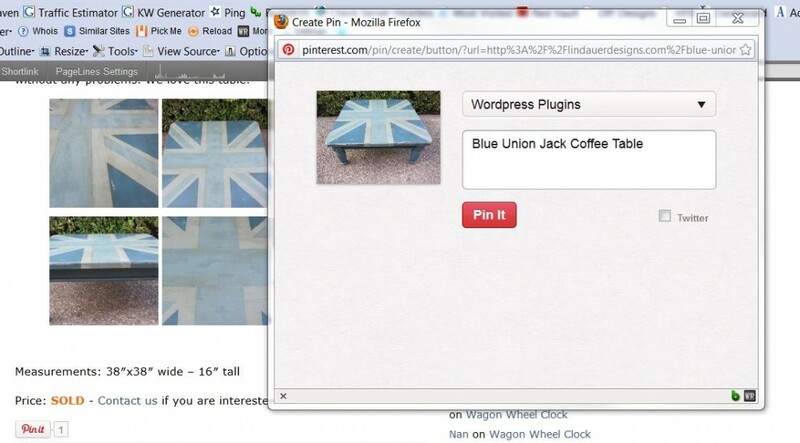 Now there’s a plugin called Pin It On Pinterest that makes it easy for WordPress sites to add a “Pin It” button to the end of posts. Install and activate the plugin and then you’ll be able to tailor the “Pin It” button on a post-by-post basis. It will add a box to the post editor for you to fill in the description of the pin and assign the image you’d like for it to pin when the button is clicked. The button will then be added to the end of your post with a little tracker to show how many pins your post has received. It automatically populates the box with your description and image. Of course, the user can still edit this information. Your image, text and the link to your site are then automatically sent to Pinterest, giving you another avenue to gain valuable traffic from visitors who are genuinely interested in your content. Pros: This plugin allows you to choose the image & description per post that will be pinned. Con: You have to set this manually for every post – which is a pro and a con. Not all posts should/will need a pin – but if you’ve been doing this for a long time, you’ll have a lot of catching up to do. Alternatively, there are several general sharing plugins out there for WordPress that already include Pinterest as an option. You can install one of those and it would be implemented site wide – but again you loose some of the control.